What I love about this book is that it combines two of my top interests in one topic: unconscious bias and growth vs. fixed mindset. When I conduct workshops on unconscious bias, everyone is nervous to begin with. We feel that if have any bias (conscious or unconscious), we are bad people. So we invest a lot of energy in proving that we don’t have bias. 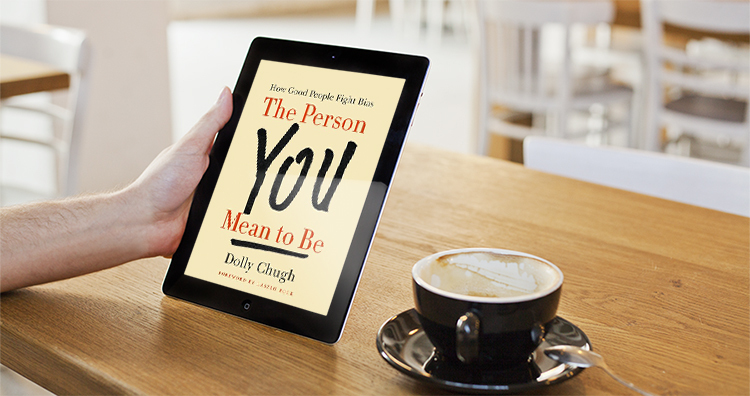 In a conversational, accessible way, Chugh shows how we can be good people and still have bias. She redefines what it means to be a good person as someone who is trying to be better, as opposed to someone who is allowing themselves to believe in the illusion that they are always a good person. By seeing ourselves as “trying to be better,” we are employing a growth mindset. The terms “fixed mindset” and “growth mindset” were first used by Stanford University psychologist, Carol Dweck. People with a fixed mindset believe their basic qualities like intelligence, talent, abilities, character are fixed traits. They can’t be changed. So people with a fixed mindset might believe that they’re just not good at math. People with a growth mindset, believe that their abilities can be developed through hard work and effort. According to Pugh, people with a growth mindset have the attitude, “I’m a work in progress.” By adopting that mindset, we can remain curious when faced with facts, studies, information that may be counter to something we believe to be true. She refers to the invisible biases that surround us all as “cultural smog.” “Smog surrounds even those of us who are in or care deeply about the stereotyped groups.” Research shows that women, as a whole, show stronger implicit gender bias than men. Black Americans are just as likely to show pro – white implicit race bias as pro – black implicit race bias. For anyone who is interested in bias, culture, or equality, this book is a must for your bookshelf or Kindle.